Blush + Blow started out as a seed of an idea in the mind of make-up artist, beauty blogger and entrepreneur Bridget O’Keeffe. Aiming to combine her skills and fuse her background in beauty with her mantra ‘blow dries are a girl’s best friend’, O’Keeffe sought to create somewhere that meant, as Blush + Blow’s website declares, ‘there really is nowhere else you will need to go for all your beauty, blow dry and skincare needs’. Arriving early, I had a few minutes to sit and take in the surroundings. 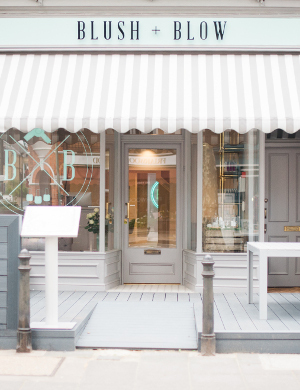 Blush + Blow is right on the New King’s Road, next to Parsons Green, and its fully windowed frontage both contributes to the interior’s light, airy feel and provides a good place to cuddle a cup of tea and watch the well-heeled Fulham world go by. The interiors are based on a soothing palette of warm greys and gold accents. 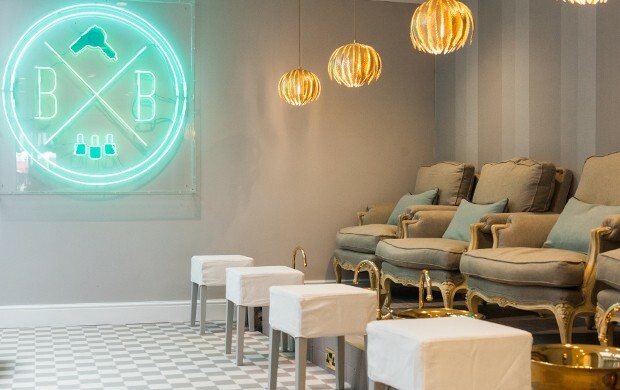 The treatment rooms downstairs are minimal and spotless in cream tones, while upstairs the blow-dry mirrors are sleek, unfussy rectangles edged in gold, and the grey leather chairs have Blush + Blow’s logo subtly embossed on their backs. The rear made me lust after a manicure, kitted out as it is with the comfiest-looking armchairs I’ve seen in some time, next to neat little gold basins for pamper-seeking feet. It wasn’t long before I was ushered to meet Georgie, my facial expert for the morning, and we moved downstairs as we chatted about my skin trials and desires. I was honest with her—I had never had a facial before, and didn’t know exactly what I wanted from one. I’m not sure why facials had evaded my sights for so long; part feeling that they seemed a bit high-maintenance, part dubious that I expected much real effect from one, and part reluctant to wander home afterwards completely free of my usual facepaint, perhaps. Georgie touched on the benefits of regular facials while I removed my makeup. I had been even more lax about my skincare than usual in the weeks before the appointment, and she tutted over my admission that I never moisturised at night (I have oily skin—it feels superfluous!) and marvelled at my huge pores (to be fair, I mentioned them first, so it was more polite agreement that they were a bit stretched). She got started on the treatment; Blush + Blow uses the Ren range, which is 100% plant and mineral-derived and has a cult following for its clinically proven, hi-tech skincare. As my face and head were gently massaged amid the delicious scents and soft music, I lost track, in my relaxation, of the plethora of potion varieties Georgie picked up, but I believe there was some of the Ren classic Rosa Centifolia cleansing in there, as well as Clarimatte products to rebalance skin and reduce pore size, and Radiance for clarified luminosity. Towards the end came a process euphemistically called ‘extraction’—in other words clearing some of your clogged pores. This was physically painless but more psychologically awkward. What do you say at a time like this? Apologise for your dirty skin habits? Make rash skincare promises in your compromised position? I ended up keeping my judicious peace, figuring she probably sees similar regularly. Then it was more cleansing and a moisturiser, before I rearranged myself for the second half of my appointment upstairs. Here Georgie, having displayed her skincare credentials, proved her thoughtfulness as well. Reluctant to go completely bare-faced after the facial, but advised by her that putting my usual foundation on my freshly exfoliated skin was a bad idea, I was feeling a little exposed. Georgie immediately let me loose on the in-house makeup, explaining that Jane Iredale is one of the few mineral make-up brands that is genuinely composed completely of minerals, so is fine to apply immediately after treatments. Next I met Lamia, who had me sitting in front of one of the hair section mirrors a few short minutes and another head massage (and hairwash) later. By now feeling pleasantly laid back, cocooned in towels and new make-up and the glow from my tended skin, I vaguely gestured and said something about ‘a bit more volume’—my usual follicular complaint—and then zoned out with a new cup of tea as hands full of hairbrushes, sprays and hairdryers whizzed about me. Before I knew it I was finished and ready to face the world, my newly brushed and blown hair falling sleekly around my face. The whole experience left me feeling like I was walking on air, and beginning to understand why some friends are so addicted to spas. The real highlight, though, was the facial; I went from someone who had debated doing it at all, so reluctant was I, to a complete convert. I genuinely saw a difference in my skin tone and even—gasp!—significantly reduced pores after this one session, and a glowing tautness to my skin that came from replenishment, rather than a harsh assault by the usual astringent alcohols. The effect lasted visibly for a couple of weeks afterwards, and left me motivated to improve my skincare routine in general. Moreover, I found a new favoured foundation! 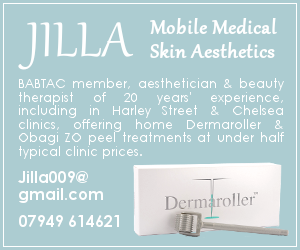 If you would like to stay up to date with our beauty reviews, subscribe to our weekly e-newsletter.